The event and exhibition industry is continually growing and changing; no two exhibition seasons are the same. Much like any other sector, the exhibition industry goes through trends, meaning what was ‘hot’ last year might not be the bestselling product this year. For a long time, traditional pop up display stands have been the go-to option – but that could all change in 2019. Fabric Displays are not a new exhibition solution, but never have they been as popular as they are now. With more variety in terms of shapes and sizes than ever before, TEXstyle exhibition stands are rapidly becoming a favourite amongst all types of businesses and brands. 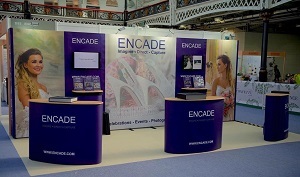 Fabric exhibition stands are incredibly lightweight and portable. Paired with their effortless, tool-free self-assembly, fabric display stands are a must-have solution for businesses who travel and exhibit a lot. In addition, the intense dye-sublimation printing process that is used to print the graphics means that fabric displays are among the most durable exhibition solutions available. Ink is forced into the fibres of the display polyester which allows the graphics to be folded, used and even washed at 30 degrees time and again without incurring any damage. With double-sided printing coming as standard and the option of replacement graphics each time your marketing campaign changes, stretch fabric displays are a cost-effective display solution that will last you a lifetime. Choose from a broad range of Formulate Fabric Exhibition Stands in straight or curved configurations in sizes ranging from 2.4m wide all the way to 6m wide. With an enlarged graphic area and edge to edge marketing exposure, fabric exhibition stands are ideal for use a branded fabric back wall or as a photography backdrop. 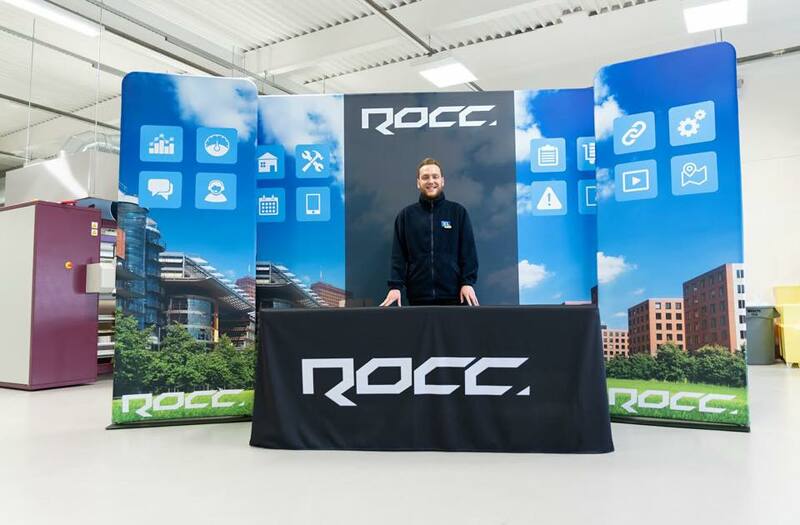 Alternatively, opt for a pop up fabric display such as a Hop Up Fabric Pop Up Stand or a SEG TEXstyle Fabric Display Stand if saving time on the assembly is the most important thing to you. Without comprising on graphic quality, pop up fabric displays take just minutes to build and pack away just as fast for a swift and effortless exhibition experience. If you have a smaller exhibition area, a Fabric Banner Stand is a perfect solution. The Monolith Fabric Banner is a versatile, straight back wall, whereas the Formulate Snake Fabric Banner offers a more unique shape that will add more dimension to your stand. For the team here at XL Displays - and a lot of other people around the world - are hoping to make 2019 one of the most sustainable years yet by reducing the waste we produce and the impact our lifestyles have on the planet. This is all the more reason to invest in a fabric display stand. All of our fabric displays are printed using environmentally-friendly, water-based inks. In addition, we only use fully recyclable fabric. Our fabric exhibition stands not only look good, but they don’t cost the Earth, either. Exhibition lighting has been around for a long time, but it has never really been considered an exhibition stand staple until now. Adding LED Spotlights to your exhibition stand – either fabric or vinyl – will illuminate your artwork and enhance the overall aesthetic of your display. Our LED spotlights are supplied with our pop up exhibition stands as standard, but they are available to purchase separately if you already have an existing display. Our spotlights use 1200 lumens which ensures a bright light output, whilst the 5600k colour temperature provides a soft, natural white glow that isn’t harsh on the eyes. Each light has a CRI (colour rendering index) of 85+ which means that the light won’t distort the colours of your graphics; instead, it will enhance them naturally for a true-to-form colour pay-off. If you’re looking for something slightly more contemporary, an LED Light Box is perfect. Light boxes illuminate your artwork evenly and distribute light to enhance your exhibition stand and peak interest from passing visitors. Using UV-printed fabric graphics that simply slot into place, light boxes are the perfect accessory for creating a dynamic and modern exhibition stand. Our lightboxes come in a wide range of sizes, but we also offer bespoke sizes for businesses who need something a little bit more custom. If a light box isn’t quite what you’re looking for, add some flair with a Lumos Tower. With a small footprint but maximum impact, Lumos Tower’s pack a punch when it comes to increasing footfall and maximising brand awareness. The slim tower features a high definition graphic wrap that is illuminated by an internal LED light. Available in three heights, the Lumos Tower is the perfect accessory to any exhibition stand, retain environment or reception area. With so much competition to get the attention of exhibition attendees, it’s essential that your brand is the one that stands out the most. This largely comes down to generating interest in the most innovative way whilst maintaining a professional and informative demeanour. An easy way to tackle this problem is by making your display stand interactive. Simply adding a Monitor Bracket that plays an advert relating to your brand is a simple and cost-effective solution. Get visitors involved by installing an iPad Stand and having them play a game or a quiz related to your business sector. Alternatively, use an iPad stand or a VR set to host a competition – people love to win things and this a sure way to make people remember your brand. If you’re attending an exhibition or an event this year and you want to make an impact, consider the above display solutions. They are cost-effective, versatile and suitable for all applications which guarantees them a place on this year’s exhibition must-have list. Get in touch with a member of our team to discuss your display options today by calling 01733 511030.